There are few things that bring people together better than sharing a delicious meal, and for Berks County residents, the options abound for sampling amazing cuisine! From unique bars to quirky restaurants, the Best of Berks 2016 highlighted the top dining places to explore throughout the region. If you’re looking for a fresh take on an old classic, the five different locations of Pretzel Revolution is a great place to start. 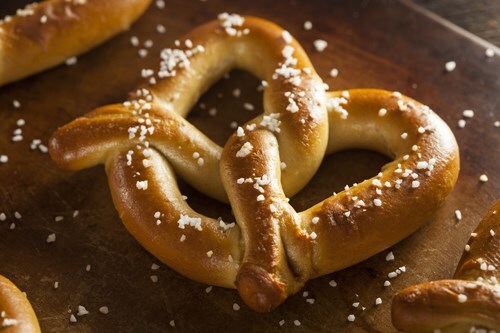 At this unique eatery, traditional sandwiches and snacks are given a modern makeover by wrapping your favorite food combinations in the “perfect pretzel dough” to create a mouthwatering treat. You can experience this exciting dining experience for yourself by looking for them at area festivals, the Renniger’s Farmers Market or one of their local permanent locations. For many people, the best dining experiences are ones where you feel as comfortable in the restaurant as you do in your own home. For a relaxed atmosphere and fantastic food, you can’t beat Jimmy Kramer’s Peanut Bar. This famous bar featured on The Travel Channel serves you a bowl of peanuts and lets you toss the shells right on the floor –you can’t get much more relaxed than that! They also serve a wide selection of grilled burgers, steaks, seafood, and classic fried appetizers that makes it the perfect place for any palate. The list of top Berks County restaurants doesn’t stop there! From the cozy atmosphere of Winedown Café & Wine Bar to contemporary fine dining at Dans at Green Hills, this scenic region of Pennsylvania offers limitless choices to satisfy all your food cravings. While Berks County offers well-rounded entertainment for anyone visiting the region, it is also one of the top places in the state for families and professionals to call home. When making your move to beautiful Berks County, you need to know that you are working with a local moving provider that is familiar with everything the region has to offer. At O’Brien’s Moving & Storage, our local Berks County movers have proudly served the area for over 80 years. We offer a wide range of professional moving and storage services to suit the needs of our customers, and we’d be happy to help you plan a stress-free relocation! To find out more about our Berks County moving company, just give us a call or fill out our online form for a free, no-obligation estimate.